I woke up this morning with the itch to bake! I much prefer baking over cooking, but you can’t always eat cake! Since the hubby had a 4 hour drive for work this morning, I decided to make him this special treat for his long drive! 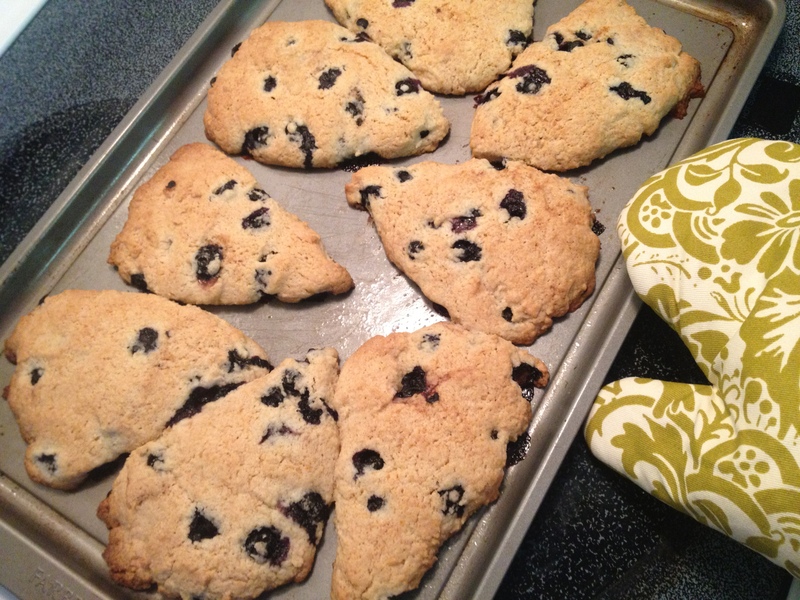 I started writing this entry while the scones were baking, and let me tell you…it has been VERY distracting so far!! :) The smells have been divine! So then I had to stop and eat. Stop and clean up. Stop and play with the puppies…etc. You know how that goes! You start off with mixing your dry ingredients: 2 cups flour, 1 cup sugar, 1 tablespoon baking powder, 1 stick of butter, and the lemon zest. 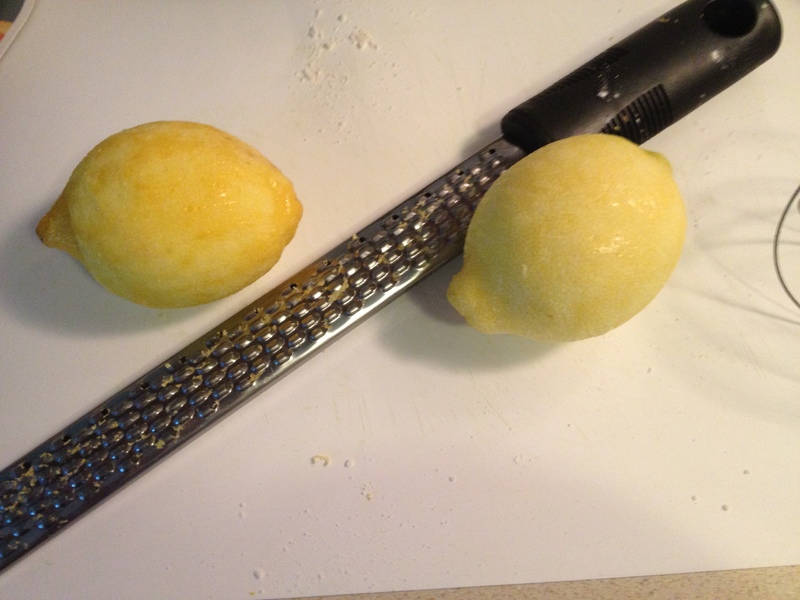 For my visual readers, here are the lemons, coy and shy after de-robing. My food processor was too small to hold everything, so I brought out my hand mixer (not pictured). I don’t think I have used it more than three times in the three years we’ve been married, but I have a feeling I will be using it a LOT more now ;) The butter didn’t want to blend well, so I did my best before adding the wet ingredients. Wet ingredients, before and after. Add this to the dry ingredients and mix well! 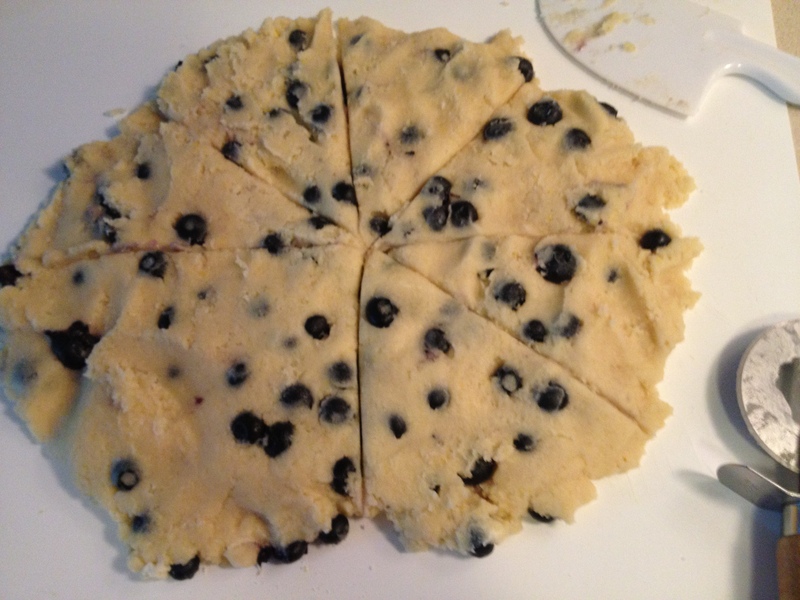 I then positioned the slices onto a greased cookie sheet. Leave as much space as possible between the scones. The baking powder makes them GROW! Here’s a peek as they were baking! I couldn’t contain myself…they smelled delicious! As you probably guessed, they were scrumptious! My husband and I both hummed with delight. I gave one to my neighbor and she sheepishly came back and said it was gone before she ate it. Her husband gobbled it up!! I gave her another and she was happy! I will DEFINITELY make these again! My town has a farmers market that opens on the weekends. I am planning on making these with raspberries next time. It was so easy to make (once I knew what I was doing). Tune in this weekend for Raspberry-Lemon scones! Yay! 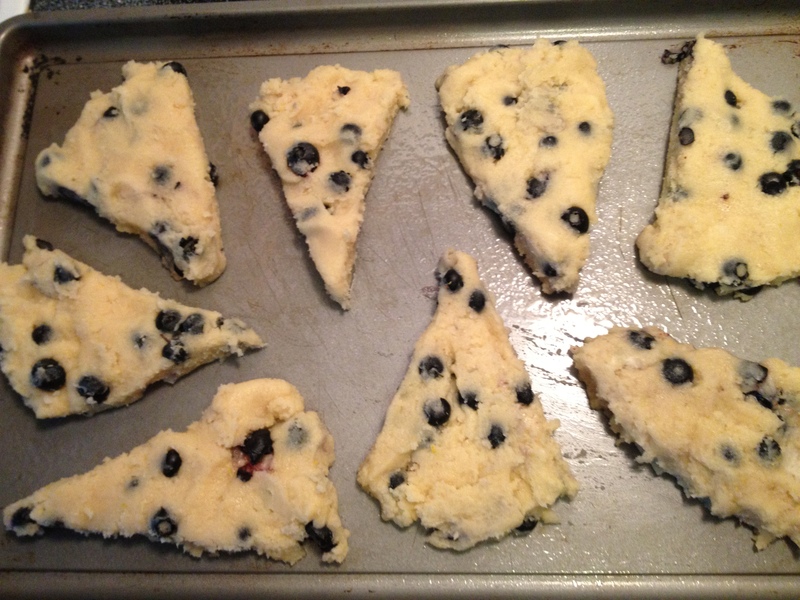 These scones look great. Thanks for sharing the recipe! Hi there! Glad to see you are having some fun down South. 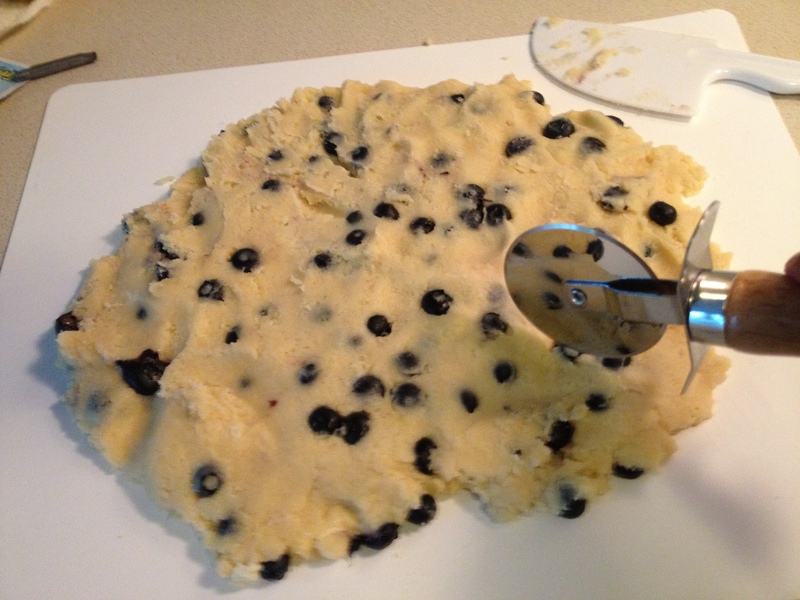 You might want to try a pastry cutter or a pair of knives to cut the butter into the dry ingredients, or a food processor. Works better than banging away at it than a hand mixer. 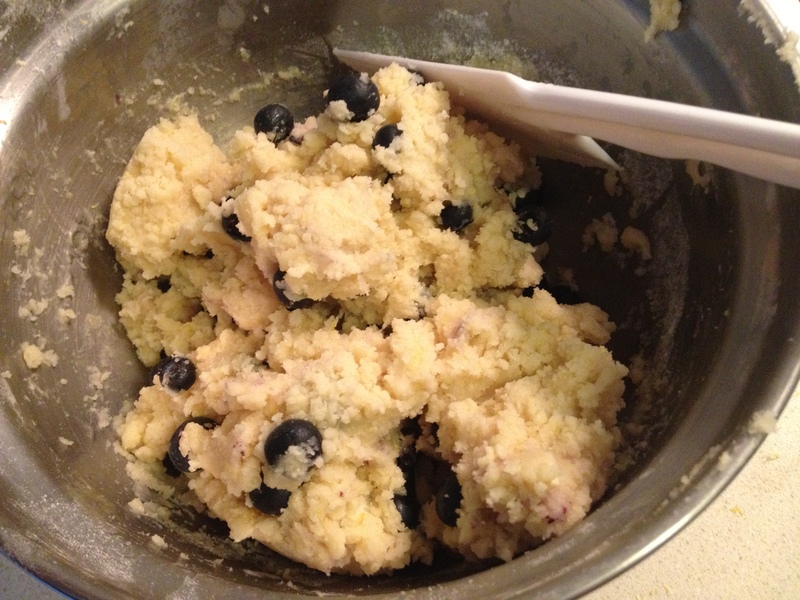 I usually use a fork to mix in the wet ingredients – because that’s how my grandmother and dad taught me how to make biscuits. Anyway. Food for thought. Looking forward to trying the recipe! Thanks Amy! 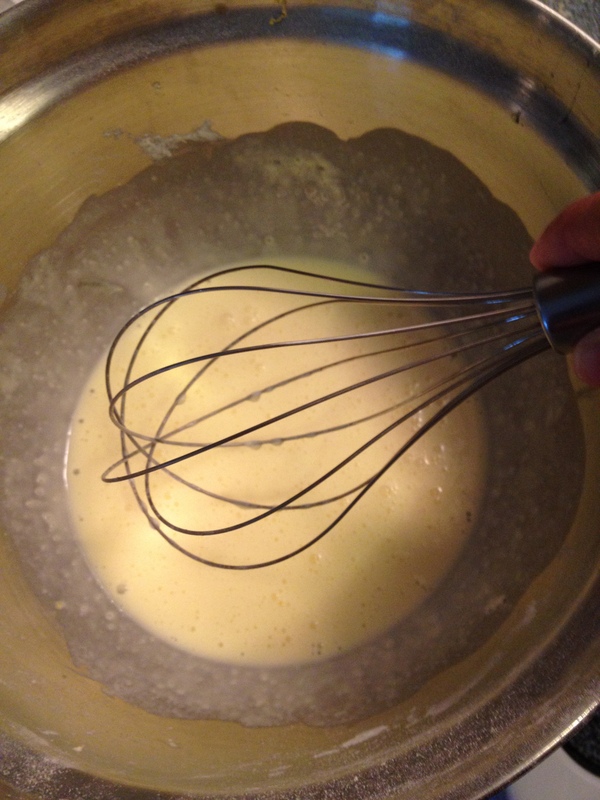 I hurt my right hand (I’m a righty) so I used a handmixer to ease up on my hand. However, I will definitely use your techniques this weekend when I make raspberry scones. 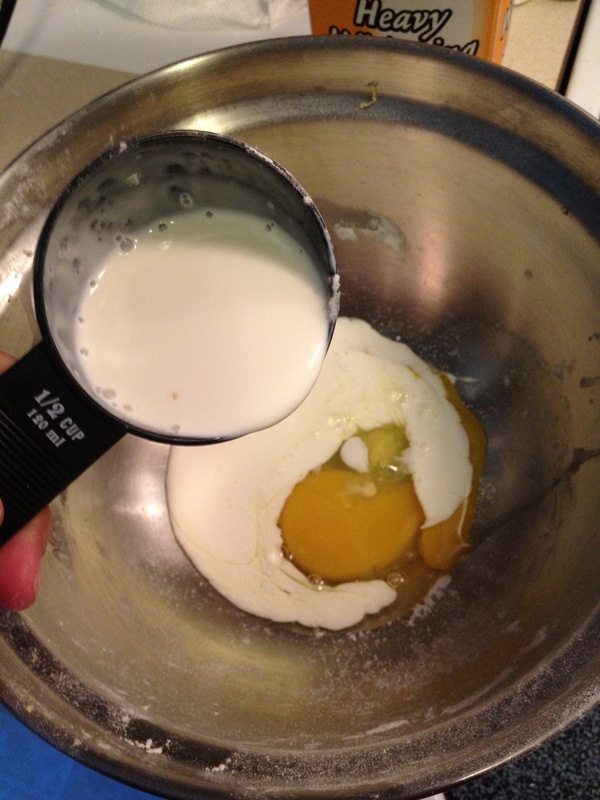 The problem was mixing the cold butter in the dry ingredients, not mixing the wet ingredients into the dry. That part was the easiest. 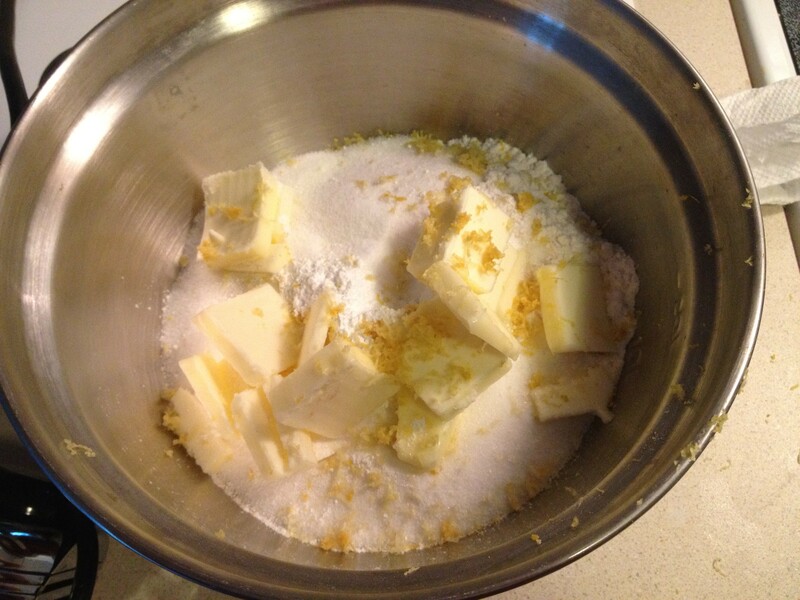 I wonder if fluffing up the butter first before adding the other dry ingredients would still yield good scones? I’ve done that with Tres Leches cake and it worked out great. Yes, it can help. I have a recipe for strawberry shortcake that says to grate frozen butter. Major PIA so I don’t make it that often and when I do I still put it through the food processor grater.